Biography: Since its inception in 1994, the New York-based Sejong Soloists has established itself to be the premier, string orchestra performing on major stages across four continents. Envisioned as a “cultural ambassador” by Artistic Director Hyo Kang, this unique ensemble brings together individually distinguished solo and chamber musicians hailing from eight different nations: Australia, Canada, China, Germany, Japan, Korea, Taiwan, and the United States, in performances, documentaries, TV broadcasts, youth development activities, as well as philanthropic endeavors worldwide. 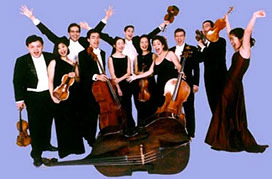 Renowned for its cohesiveness, beautiful sound, and refreshing musical style, highlights of Sejong include repeated performances at Carnegie Hall, Lincoln Center and The Kennedy Center in the United States; Wigmore Hall and Cadogan Hall in London; Salle Gaveau in Paris, Suntory Hall in Japan, Seoul Arts Center in Korea and the National Arts Theatre in Taiwan among many others. Sejong was ensemble-in-residence at the Aspen Music Festival from 1996 to 2005 and performed at Casals Festival in Puerto Rico, International Cello Festival in Manchester, England, La Jolla SummerFest in California, and Taipei International Music Festival in Taiwan. Sejong was the host ensemble for the Great Mountains International Music Festival in South Korea from 2004 through 2010. Sejong has released six highly acclaimed albums and has been featured in several documentary films. Sejong is regularly broadcasted on National Public Radio’s Performance Today and has made special appearances on CNN programs hosted by Paula Zahn. Sejong is highly committed to creating new repertoire and forging new collaborations across different disciplines – commissioned new works include pieces from composers such as Augusta Read Thomas, Behzad Ranjbaran, Sukhi Kang, Eric Ewazen, Jay Greenberg, and Richard Danielpour, to name a few. Sejong has collaborated with artists such as Joshua Bell, Sarah Chang, Kyung Wha Chung, Vladimir Feltsman, Leon Fleisher, Lynn Harrell, Sharon Isbin, Joseph Kalichstein, Garrick Ohlsson, Cho-Liang Lin, Gil Shaham, Jian Wang and the Juilliard String Quartet. While performance is the ensemble’s main priority, Sejong holds music education in the highest regard when considering its contribution to the arts community. Sejong regularly performs outreach concerts and conducts master classes for students of all ages and levels.